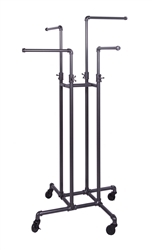 Fixed Swivel Hang Bar mounts easily to the top rail of the Bronze Freestanding Merchandising Unit. 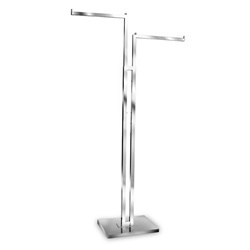 The hang bar is constructed of 1" square tubing. Each hang bar has a drop down of 3". The split swivel hang bar design allows user to have both bars in position to create a traditional hang bar, or it can be swiveled to create a faceout layout.